We may see our family Christmas stockings only once a year, but we can easily conjure their exact details any time of year, year after year. And so they had better be special! 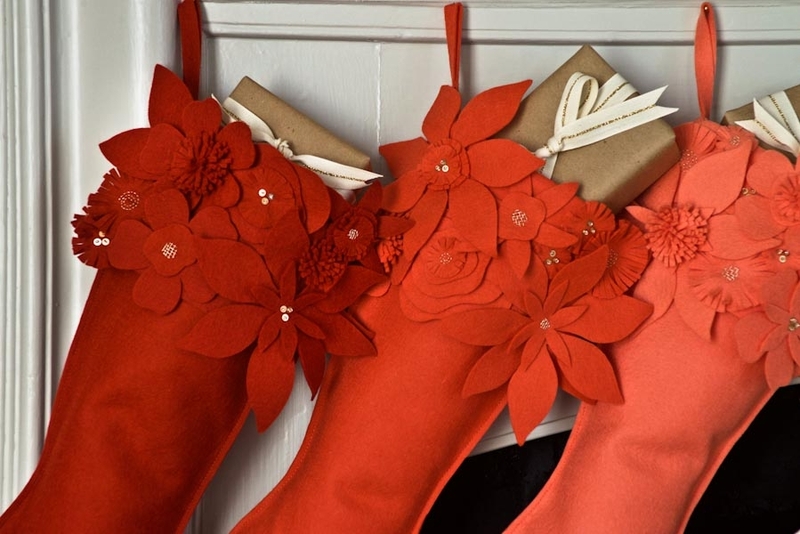 Our Winter Flower Christmas Stockings are just that, with wool felt flowers decorated with embroidery, beads and sequins. We borrowed these flower shapes and embellishment techniques from our Winter Wreath Pattern and applied them to these super easy-to-sew Stockings. 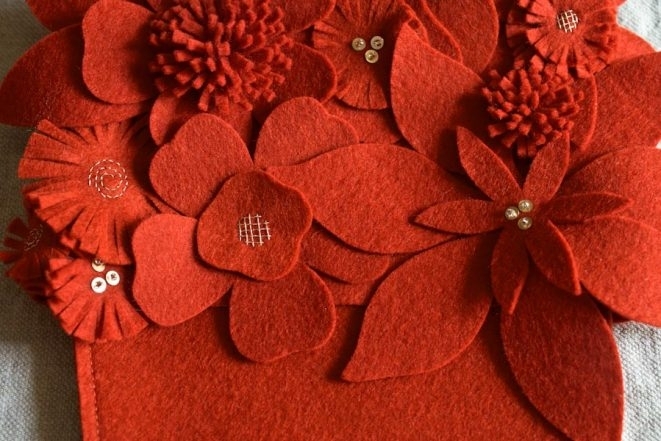 Two 18 x 18-inch pieces of Wollfilz’s Wool Felt Pieces, 1mm. 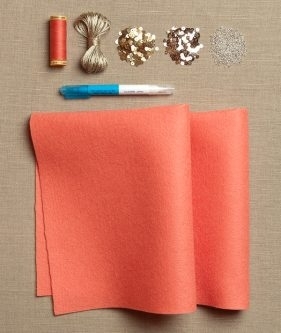 We used the colors shown above, clockwise from the top left: Ecru, Salmon, Brick, and Coral. A 110-yard spool of Gutermann’s Cotton Sewing Thread to coordinate with the felt. We used 1040 for Ecru, 4860 for Coral, 4850 for Brick, and 4860 for Salmon. One skein of embroidery floss. 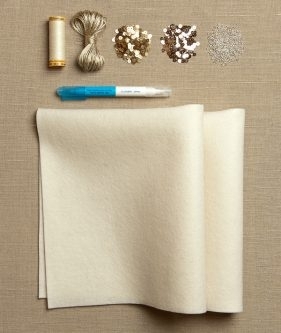 We used DMC’s Metallic Embroidery Floss in White Gold. A free Winter Flower Christmas Stocking Template, printed, prepared and cut out. 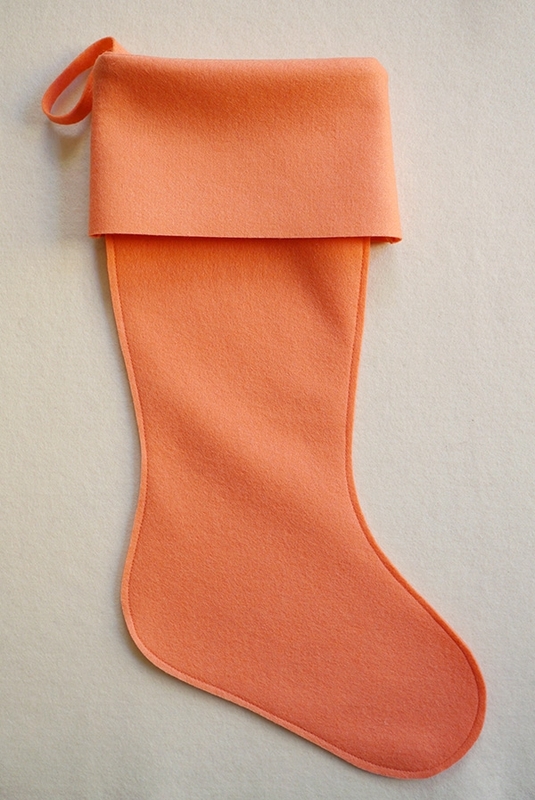 Two pieces of Felt are enough to make one Stocking. 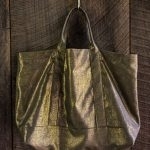 The rest of the materials are enough to embellish many Stockings. 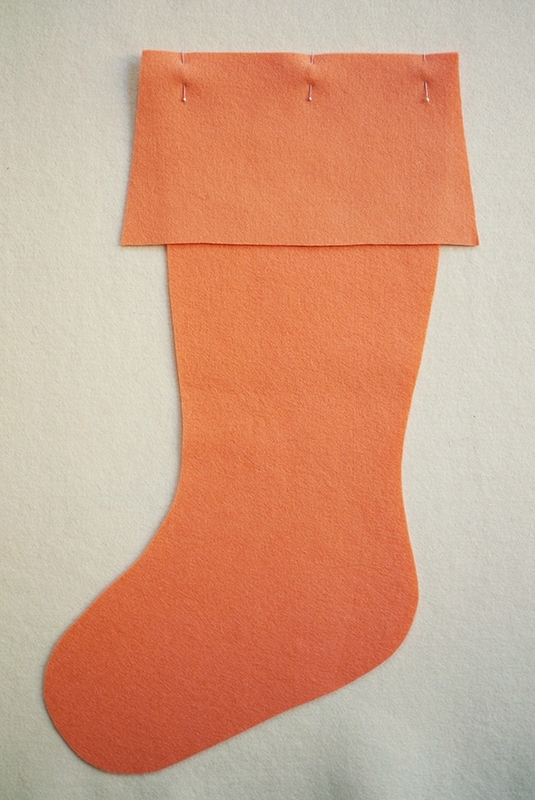 Our instructions describe how to make a Stocking with a right-facing toe. If you wish to have the toe point to the left, reverse all “right” and “left” directions. 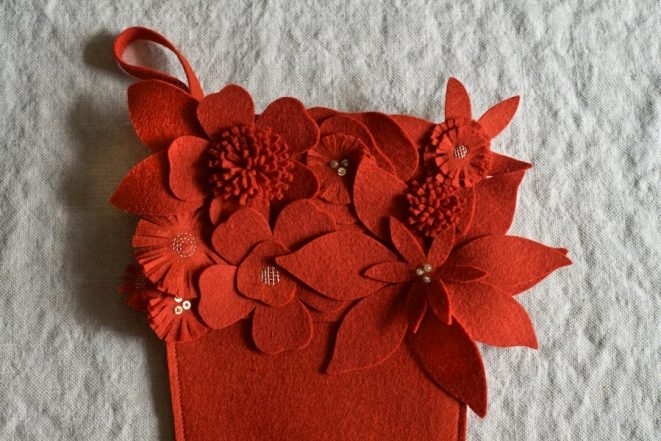 Use the prepared Winter Flower Christmas Stocking Template to cut 2 Foot pieces, 2 Cuff pieces, and one Hanging Loop from the felt. Lay one Foot piece flat so that its straight edge runs across the top and the toe points to the right. 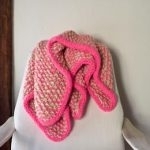 Fold the Hanging Loop in half so that its two short edges meet. 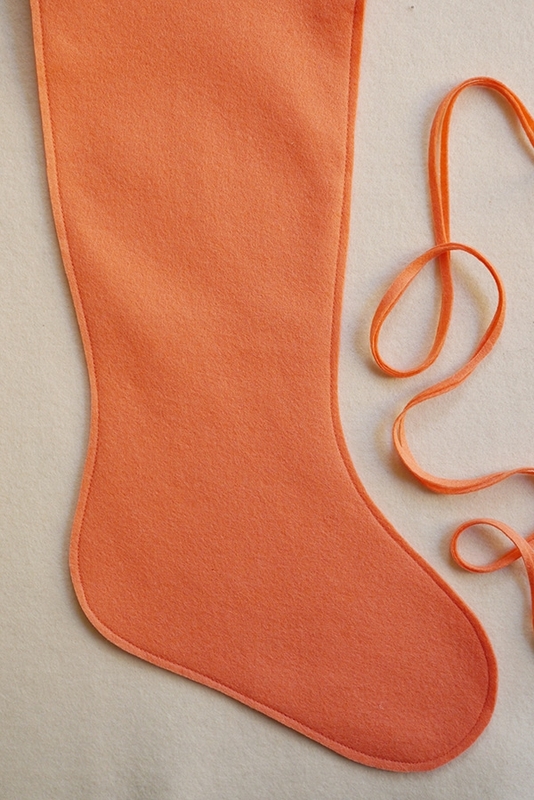 Lay the Hanging Loop on top of the Foot piece so that the short edges are aligned with the top straight edge of the Stocking, ¾ inch in from the left top corner. Now, lay one Cuff piece on top so that its top edge is in line with the top edge of the Foot. Pin the two pieces together along their top edges, making sure to pin the Hanging Loop in place as well. Sew along the pinned edge with a ¼-inch seam allowance, backstitching at the beginning and end of the seam. Press the seam open. This is now the Stocking Back. Now, lay the remaining Foot piece flat so that its straight edge runs across the top and the toe points to the left. Place the remaining Cuff piece on top so that its top edge is in line with the top edge of the Foot. Pin the two pieces together along their top edges. This is now the Stocking Front. 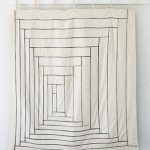 With their exposed seams facing out and the Cuffs spread flat, stack the Stocking Front and Back on top of each other. 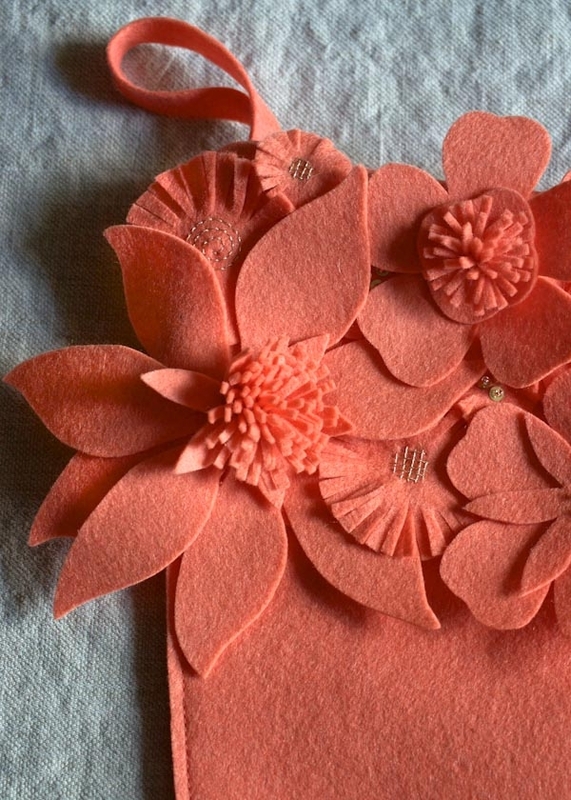 Pin the two pieces together along the outside edge (do not pin across the top edge). 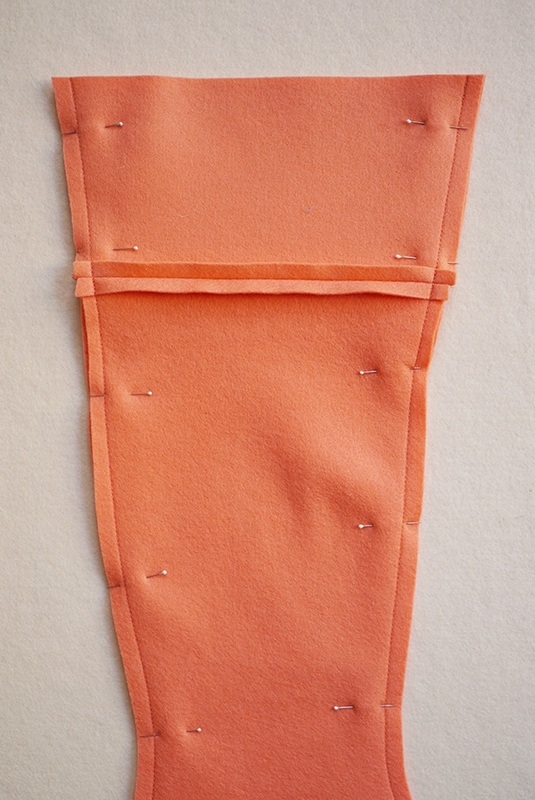 Sew along the pinned edge with a ¼-inch seam allowance, backstitching at the beginning and end of the seam. Carefully trim the seam allowance along the outside edge to 1/8 inch. For the cleanest cut, I recommend using long, sharp shears for this step. 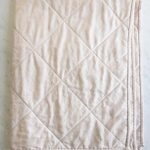 Fold the Cuff over at the seam. 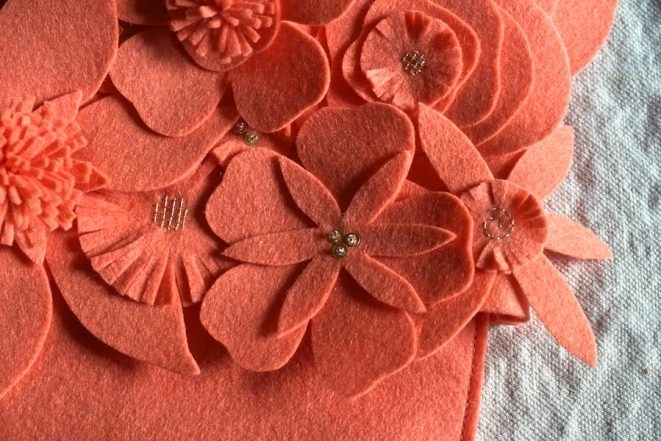 You do not need to back any of the felt pieces with interfacing. Replace the phrase “Wreath Form” with “Stocking Cuff” in all instructions. I don’t understand how much felt how much felt to order Goth stocking and the flowers. 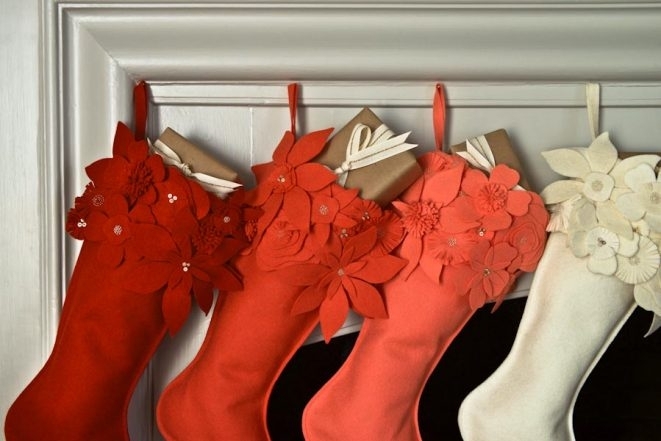 I would like to order the patterns(stocking and wreath) and the goods necessary to make a brick stocking – but can’t seem to find an ordering page for the socks and the 2patterns along with the felt, beads etc. Hopefully, you can help me. Unfortunately we don’t have a kit assembled for this pattern quite yet, but here are the links for the felt, the pattern and the beads. Enjoy! These stockings are a stunning, understated statement piece. Absolutely beautiful! ‘I will’ make them, for next Christmas. The most difficult decision will be to choose from the assorted colours. 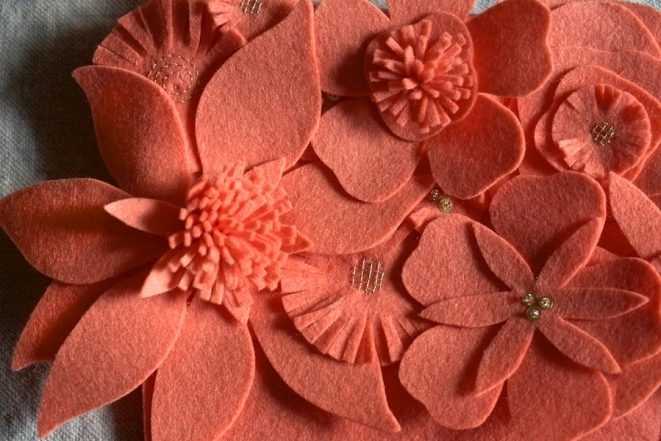 After seeing the felt stockings, I want to make the felted ornaments, as an add-on. Thank-you, for all of the creative ideas. Hello Robin! 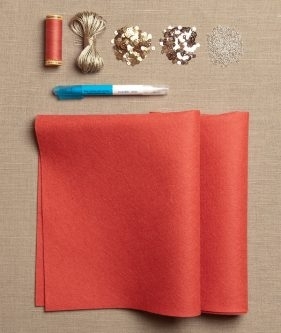 We’re so glad you enjoy these quick and festive crafts! To the special people at Purl Bee, have a wonderful Hanukkah and a very Merry Christmas! Thank you for your wonderful message! A very happy holiday season to you as well! I was so excited to see the winter flower stockings. I am currently working on the wreath but will try to sneak at least one stocking in while Im working. 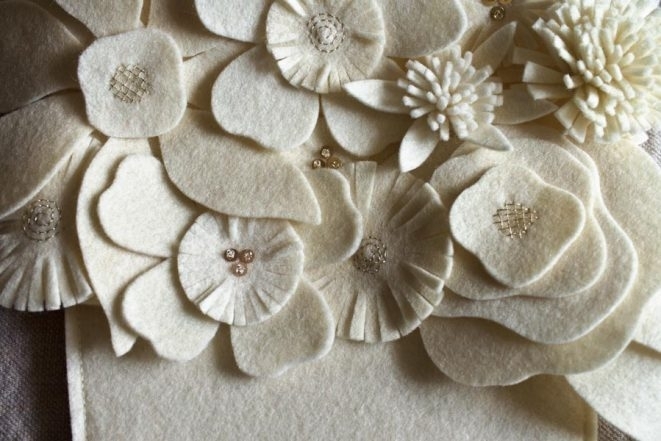 Will 2 18×18 pieces of felt be enough for the flowers too? How lovely to have the Wreath and the Stockings together! 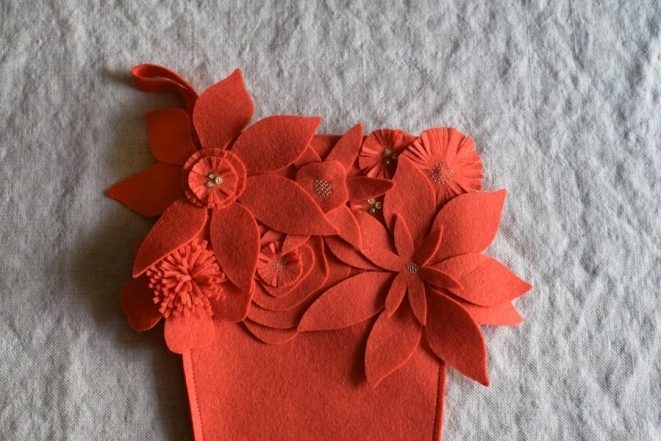 Yes, 2 pieces of the 18 x 18-inch felt are enough to sew and embellish one complete Stocking, flowers and all. I hope this helps! Please let us know if you have any other questions while you work! I made the wreath in green…i am in love…now i can’t wait to make the stockings….but I agree….some pretty ornaments as an add on would be a fab addition….thanks for being a GREAT company to work with. Thank you for your kind words about these projects, and the company! Your support means everything to us! These are beautiful! 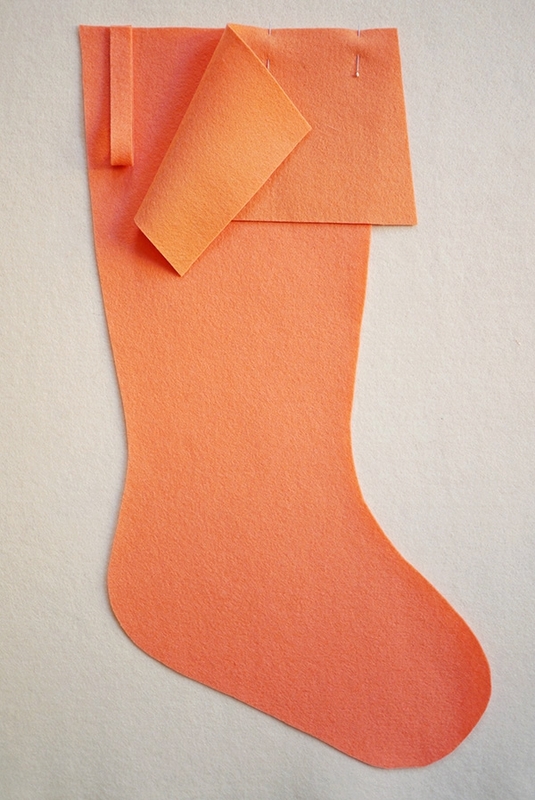 Can you suggest another complementary color of felt so that I can order supplies for a set of five stockings? Thank you! 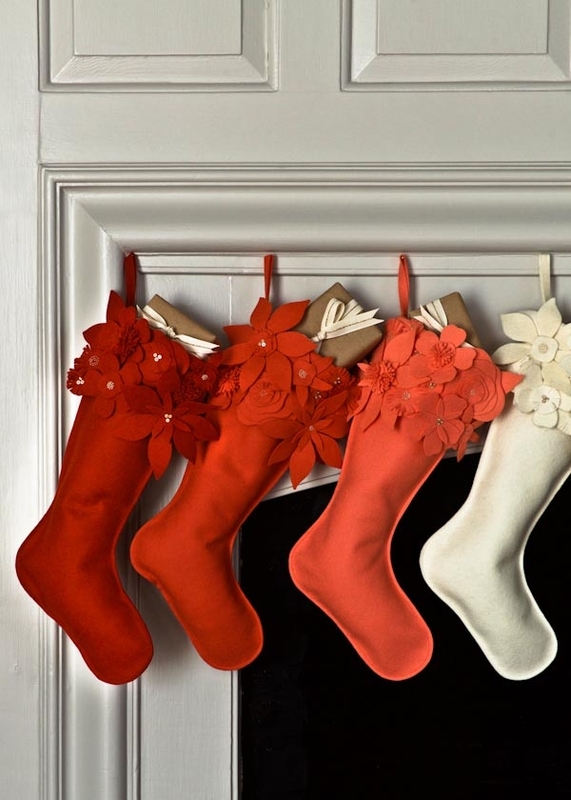 The colors that we used for these stockings are all part of our new Lusterware felt bundle. Any of the other colors from this bundle would be a great compliment to the ones shown here! 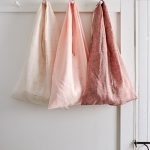 The remaining colors are Baby Pink, Pink, Peach, Apricot and Melon. You can find all of our felt colors here. 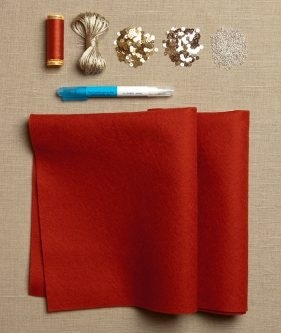 I just ordered the wreath kit and extra materials to make a stocking. 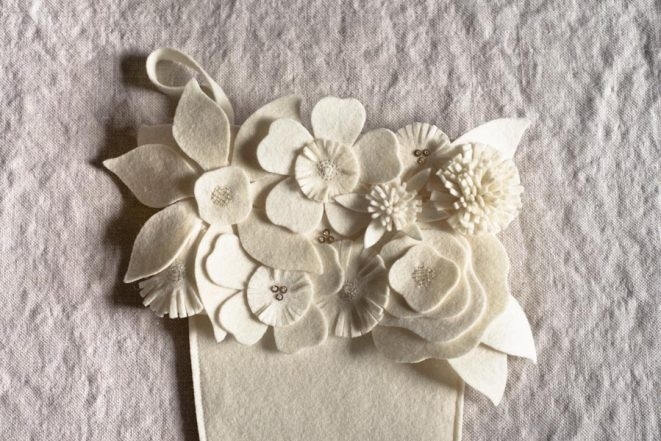 Did you attached flowers all around the cuff of the stocking or just the front? 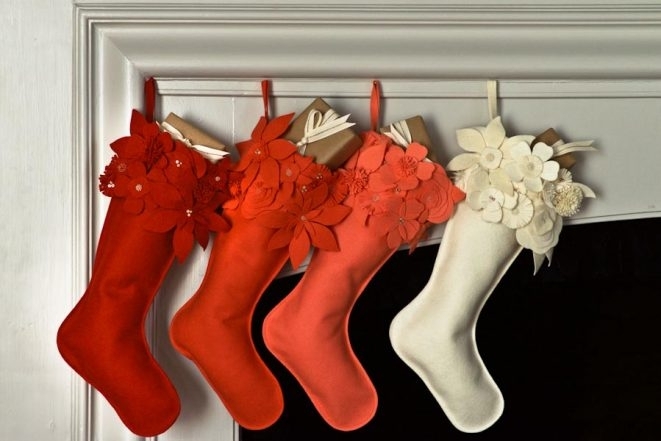 And can you give me an idea of which flower patterns and how many you used when making the stockings displayed in the photo above? Thank you! Thanks for writing in and for your questions! 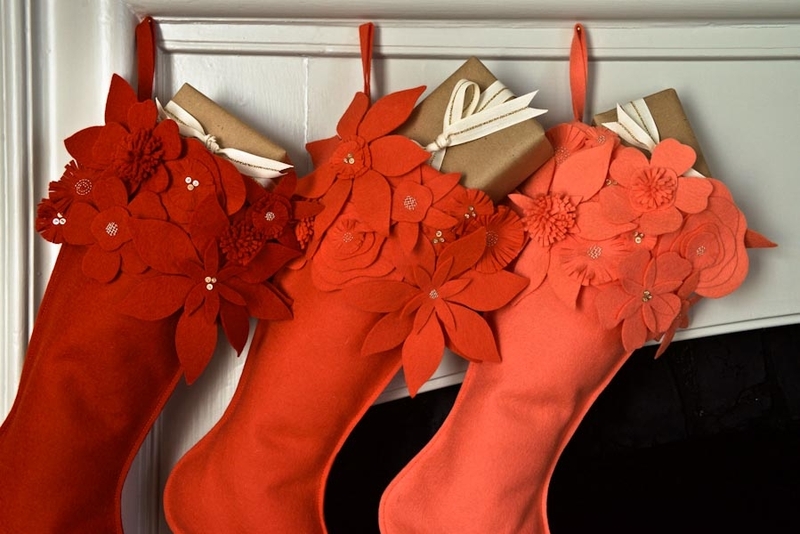 For these festive stockings, we placed flowers only on one side and the other side is mostly hidden. You can certainly place them on both sides if both sides will be visible! We also did different placement and combination of flowers on each stocking. There is at least one of each flower and 2-3 of the smaller flowers depending on what we thought looked best for any particular stocking! 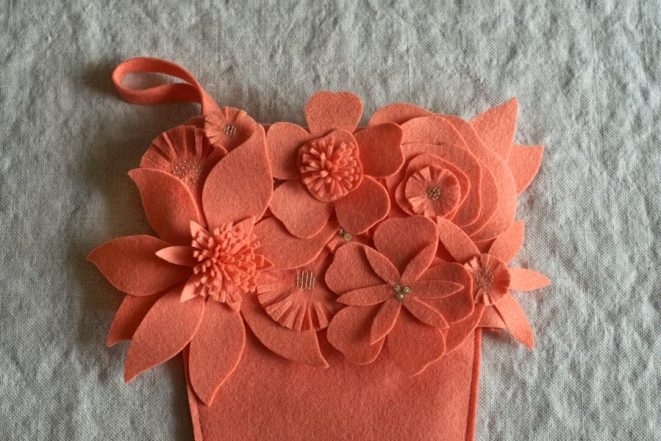 We used between 8-11 flowers per stocking so you can really use your imagination and creativity to make them special for you and your family!